This is making headlines everywhere- For the first time under the North American Free Trade Agreement, a Mexican truck crossed into the U.S. on Friday bound for the country’s interior, beginning a program that was stalled for years by concerns it could put highway safety and American jobs at risk. 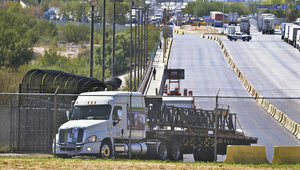 The tractor-trailer hauling a large steel drilling structure crossed the border at Laredo nearly two decades after passage of NAFTA, which was supposed to improve cargo transportation between the two countries. At a ceremony before the truck set off for a Dallas suburb, the owner of the Transportes Olympic trucking company said he considered his fleet’s access to the U.S. interior like being invited to a friend’s house. The driver of the Freightliner truck was Josue Cruz, who waved from the cab, flashed a thumbs-up and thundered toward the bridge over the Rio Grande. He was expected to unload in Garland today. Trucks have crossed into the interior before but only as part of a short-lived pilot program that began in 2007 with a limited number of vehicles. President Barack Obama’s administration canceled it in 2009, and Mexico retaliated by placing tariffs on a wide range of American goods. Hours before Friday’s ceremony in the border city of Nuevo Laredo, Mexico announced it was suspending the tariffs. But the Mexican government said they could be reinstated if the U.S. does not honor the accord. The $2 billion in tariffs was imposed on 99 U.S. products, including Christmas trees, onions, oranges, apples, juice concentrates, toothpaste, deodorant and sunglasses. Mexico reduced the tariffs after signing the trucking agreement with the U.S. in July and then removed them completely Friday. NAFTA, signed in 1994, had called for Mexican trucks to have unrestricted access to highways in border states by 1995 and full access to all U.S. highways by January 2000. Canadian trucks have no limits on where they can go. But until now, Mexican trucks have seldom been allowed farther than a buffer zone on the U.S. side of the border, where their cargo was typically transferred to American vehicles. The public debate surrounding the accord had mostly focused on the safety of Mexican trucks. But labor unions and other groups were strongly opposed to the agreement, saying it would cost Americans trucking and other jobs. The U.S. Department of Transportation says the safety concerns have been resolved. Electronic monitoring systems will track how many hours the trucks are in service. Drivers will also have to pass safety reviews, drug tests and assessments of their English skills. Mexico has the authority to demand similar measures from American drivers. If you would like further information on conditions of doing business in Mexico (NAFTA, etc.) contact www.american-development.com.